I have my second squad up and ready to paint. I have based with my airbrush and I am aiming to get this unit done much quicker then the first one. Again, a squad built on AoBr marines. You will notice Sgt. Saleos is missing an arm. Thats the magnetized arm slot allowing me to equip him differently. The only issue left is to figure out a good way to add shades to the red armor without needing to repaint the entire armor back Blood Red. If I use a dark wash, to shade the recesses it tends to need a reaaply of Blood Red before I can highlight. Any suggestions? I am also trying the red inks and washes. I want to avoid lining it by hand, but might have to. A dark brown mixed with Blood Red might work. I am hoping that the first red highlight I applyed with the base coats can still be seen through. 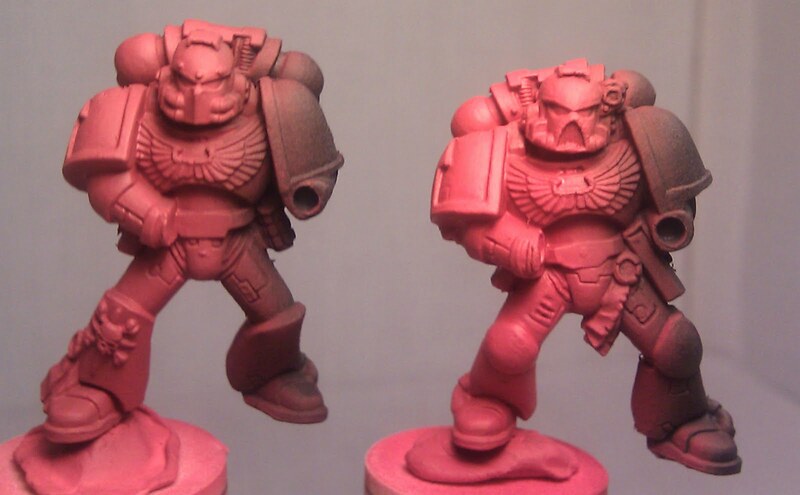 The marine on the left has the first base coat of 2:1 Scab Red/Blood Red. The right marine has had it's full Blood Red first Highlight applied. Anyone else out there have any suggestions about shading with red on power armor?